Summer is a busy time. There is so much to do and see. With jobs, summer classes and hanging with friends, that does not leave a lot of time to catch up on your favorite TV show and work out. But what if you could do both at the same time? Today, you can find pretty much anything on the internet, especially workouts. Here are some workouts you can try at home while you watch the hottest summer TV shows. “The Bachelorette” season may be underway now, but that does not mean that you cannot work out during it. This workout keeps you moving during the whole show. Follow the instructions at the bottom of the above graphic and you’ll have yourself a great workout. The new season of “Dexter” recently premiered, which gives you the perfect opportunity to start this workout. Use Dexter’s killing to your advantage and do 20 bicycles every time it happens. “Pretty Little Liars” might be a mysterious, thrilling show that keeps you on the edge of your seat, but this workout keeps you off yours. 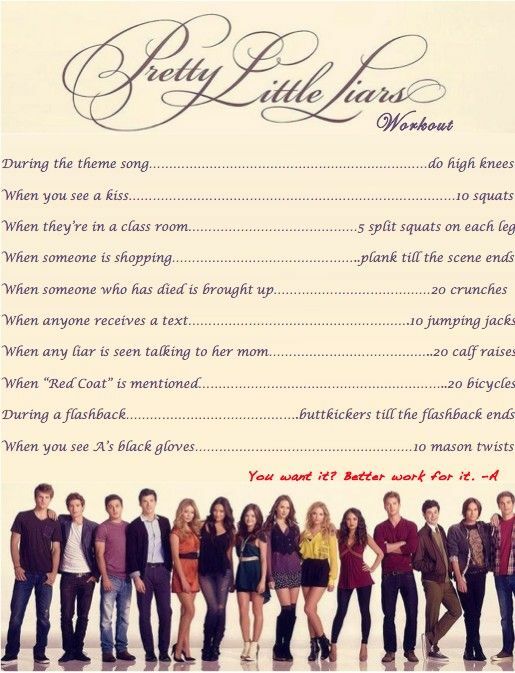 Now you can spend your Tuesday night watching the Liars and even do high knees during the theme song. The actors on “True Blood” are hot, and now you can start to look like them, too. This workout combines push-ups, squats and crunches so that you can get a full body workout. You even can use commercial breaks to rest. 5. "So You Think You Can Dance"
One of my favorite shows of the summer is “So You Think You Can Dance.” If the dancers don’t inspire you, then this workout will. My favorite part of this workout is that you have to dance every time a good song is on. This will keeping you moving the whole show, and you can have some fun. 6. "Keeping Up with the Kardashians"
Maybe you don’t want to admit it, but sometimes it is fun to watch “Keeping Up with the Kardashians.” The family might be crazy, but now you can use that to your advantage. Try this workout and you’ll be busy the whole show. "New Girl" might be a fall show, but it was just added to Netflix. If you haven’t caught onto this show, now is your chance. Start from the beginning and follow this workout. Watch two episodes and get an hour workout in. These workouts are the perfect way to get in shape this summer and catch up on your favorite shows. There are so many options ... all that is important is that you get up and moving, in anything you do.